1. 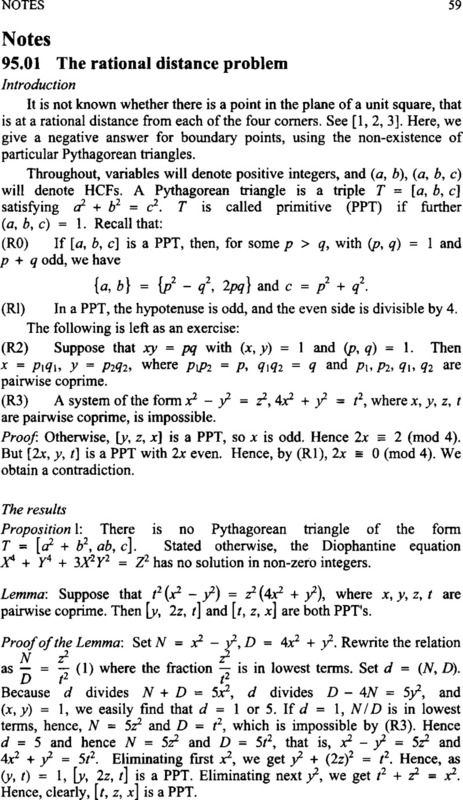 Guy, Richard K., Unsolved problems in number theory, Vol. I. (2nd edn. ), Springer-Verlag (1991), pp. 181–185. 2. Almering, J. H. J., Rational quadrilaterals, Indag. Mat. 25 (1963), pp. 192–199. 3. Berry, T. G., Points at rational distance from the corners of a unit square, Ann. Scuola Norm. Sup. Pisa Cl. Sci. 17 (1990), pp. 505–529.